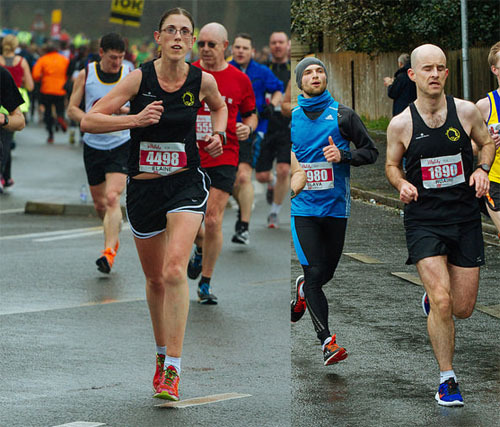 Three Eagles, Elaine Guinane, Ruari O’Callaghan and Denis Looney traveled to Liverpool on Saturday March 28 for the city’s half marathon on the following day. 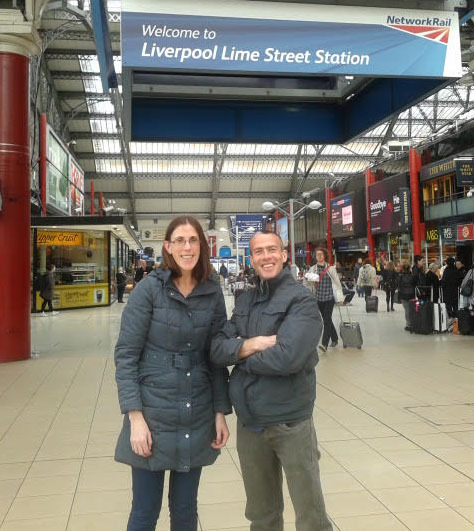 Elaine brought her better half Javier along for the experience and because he had visited Liverpool a few times in the past. 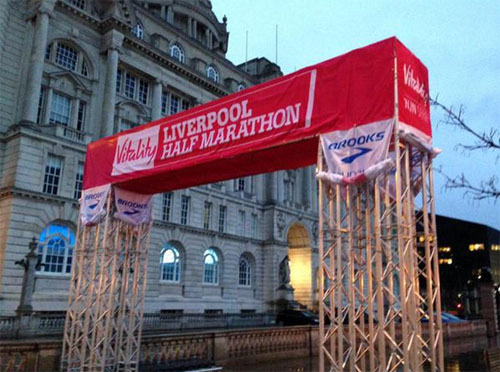 We arrived in a very windy Liverpool on Saturday morning. Ruari, whose brother Liam lives in Liverpool and thus has knowledge of the city, was a bit concerned as the last 4 miles of the race were on the promenade and into this wind. We checked into our hotel and walked the 1K to the start/finish area. 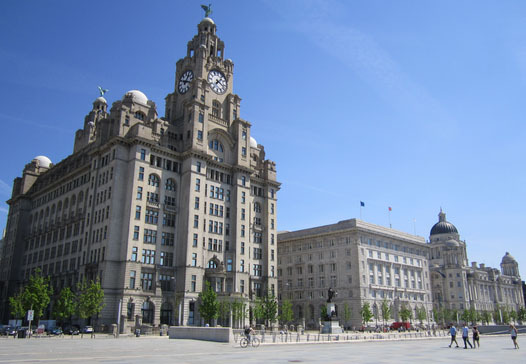 Not much to see of the race on Saturday but it’s right in the heart of Liverpool docks with museums, the Liverpool Arena, the Tate and Liver building. 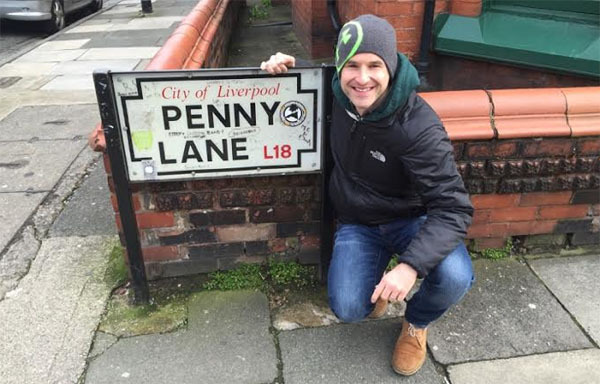 Apparently it’s a World Heritage site, so we soaked up a bit of culture for the afternoon. On Sunday morning we awoke to a grey wet day. Lots of surface water but the cold was just bearable and yahoo, no wind 🙂 . Elaine and I went to the start a bit early as my number hadn’t arrived in the post. The rain was persistent but not heavy, however it was now beginning to feel cold, about 8 degrees. In fairness the race started almost bang on time, with myself and Elaine in position between the 1.30 and 1.40 pacers saying we’d settle for 1.35. Ruari was up ahead with the elites as he was targeting sub 1.25. The starting chute was narrow but that meant we were running at race pace right after crossing the start line. 1st mile for the 5,000 competitors was flat on a wide city street. The biggest climb of the day was over a 400m stretch just after the 1 mile mark. Then it was a slight downhill to mile 2 through residential areas with a slight climb at mile 3 into Sefton Park (a much bigger version of Beaumont Park where the BHAA XC takes place). 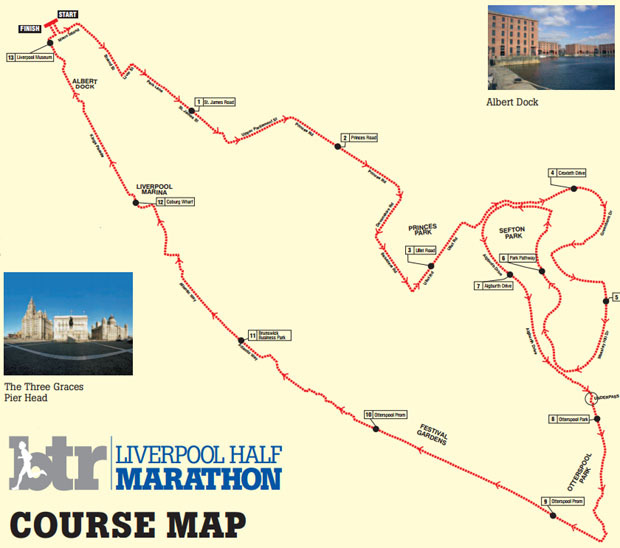 Miles 4 to 7 took us through Sefton Park, on fairly flat tarmac roads. Between mile 6 and 6.5 we had an out and back view of slower runners entering the park at their mile 4. Just before mile 8 we went through a pedestrian underpass and emerged in another area of covered parkland called Otterspool. The tarmac paths were a bit broken up but other than a few pools of standing water and mud from the persistent rain, no major issues. Just before the 9 mile mark we had a slight climb before hitting the 4 mile promenade section running north west with the Mersey on our left hand side. It was here you could truly appreciate how a wind off the Mersey (it’s a big piece of water at this point 🙂 ) could play havoc with your pace. From mile 9 to 10 it was dead flat and dead straight. From mile 10 to the finish it was still flat but we had a series of 90 degree turns as the promenade snaked in and out (right, left, left, right) which could break any rhythm you might have going. Over mile 11 and 12 the surface changed to man-made paving slabs and cobblestone (all very new but not the best road racing surface). You also had to contend with decorative obstacles (viewing seats, ships mooring bollards, 20 foot decorative anchors) all handily marked with barber tape. After the 11 mile mark we were back on the Marina, through a small business park, past the Liverpool arena and onto a cobbled section for the last mile or so. Given the weather there were decent crowds at the finish and at the major junctions. Well stocked and manned water stations at mile 3, 6, 9 and 12, a medal and good quality dri-fit. Plus I finished well enough up the field to not have to queue for the free massage afterwards. Times – Ruari 68th overall, 1:21.28. Elaine 4th F35, 22nd lady home 1:31:29, me 1:31:52. PBs all round. Ruari’s brother Liam, in only his second race ever, a very impressive 1:38:51, must be in the genes. Perhaps we should set up a Liverpool branch of Eagle AC. If you want to see the conditions, overhead and underfoot, the organisers have a clip on YouTube. Elaine makes an appearance in the Eagle colours around 1:35 to 1:40 on the LHS. So why have the words Accidental tourists in the title. Well, after the race we were sitting in a city centre restaurant at 12.30 having lunch before departing for Liverpool airport. The gloss was taken off our excellent morning’s running when we got a text from Ireland’s largest airline telling us our 3 pm flight was cancelled. Turns out the high winds in Cork meant the plane never came across that morning. Phones out and Wi-Fi on. Next flight we could get from Liverpool with Ireland largest airline was 6 days later. Yeah, right. Change of tactics. I got a flight back that night and Elaine and Javier decided to extend their stay to the following morning. (Ruari was already coming back the following day). Problem was we had to make a quick dash to Manchester Airport by train for the flights home. So we saw a lot of North Western England by foot, taxi, train and plane in the space of 30 hours………………. Would I go back again? Sure thing, if (for multiple reasons) I could be guaranteed that there would be no wind on either side of the Irish Sea. 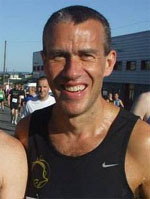 This entry was tagged 2015, Eagle AC, half-marathon, Liverpool. Bookmark the permalink.